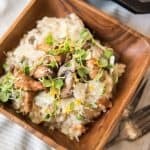 Creamy Roasted Garlic & Mushroom Risotto is a restaurant quality dish that is perfect for a special occasion dinner and can be served as either a meatless main dish, side dish, or appetizer depending on how you portion each serving. Heat a large cast iron skillet or pan over medium heat. Cook the mushrooms in 1 tablespoon of the oil for 5 minutes until they turn brown, then transfer to a bowl and set aside. Wipe out the pan and drizzle with remaining tablespoon of oil. Add the chopped shallots or onion and cook over medium heat for 2-3 minutes, until they begin to soften. Add the roasted garlic, mashing it in a bit, and season with salt and pepper. Turn up the heat to medium-high and add the rice, stirring just until the grains become somewhat translucent - about 1 minute. Add the wine and cook, scraping up any brown bits from the bottom of the pan, until the alcohol is burned off - about 2 minutes. If not using the wine, just skip this step and add the additional water or chicken stock in the next step. Turn the heat down to medium-low and add 3 cups of chicken stock to the rice. Leaving the skillet uncovered, continue to cook over medium-low until most of the liquid has been absorbed, stirring just once or twice while the rice cooks. Test the rice by tasting a small spoonful. It should be firm, but not soft. Adjust salt & pepper, as needed, then add additional stock, 1/2 cup at a time, stirring in between each addition, until the rice is cooked to your taste and the liquid has been absorbed. Add the sauteed mushrooms back into the risotto to heat through just as the rice is almost done. When the rice is done, add another splash of chicken broth to make the risotto slightly soupy and remove the pan from the heat. Add the butter, Parmesan and lemon zest to the rice and stir thoroughly until the butter is completely melted and the risotto becomes nice and creamy and finishes absorbing any extra stock. Serve immediately, garnishing with shaved Parmesan, additional lemon zest, and micro-greens or freshly chopped parsley. Many restaurants serve their risotto on the soupier side. If you prefer it that way, add an extra splash of broth to the risotto right at the very end before plating to loosen it up. Technique adapted from Recipe Tin Eats.